This day trip from Nashville to Memphis lets you to experience the character of Graceland, home to the legendary Elvis Presley. See the mighty Mississippi River in this birthplace of rock ‘n’ roll — capital of blues music and home to some of the country's tastiest barbecue. A tour of Sun Studios and round-trip hotel transport are included. Travel from Nashville, aka Music City, to the Mississippi and experience legendary Memphis on this full-day tour, starting with hotel pickup in the early morning. 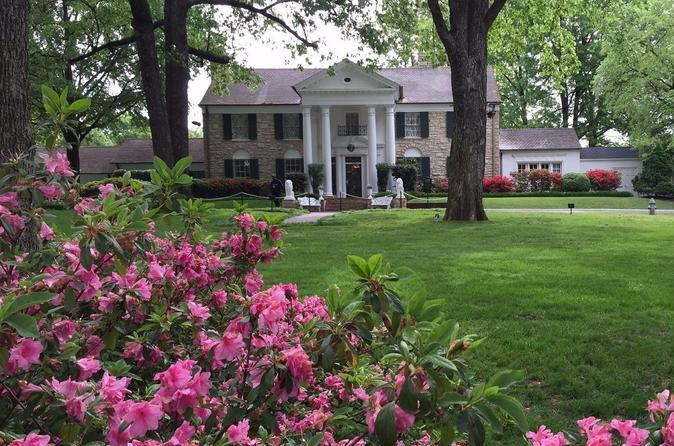 After the 4-hour journey, celebrate the history of rock ‘n’ roll with a visit to Elvis Presley’s home, Graceland. Use your VIP-access pass (complete with a souvenir lanyard) to visit the burial site of 'the King,' walk through the Elvis car museum, and see two deluxe airplanes used for tours and traveling. Take time for lunch on your own at Graceland (own expense) before re-boarding the coach to Sam Phillips’ famed Sun Studios, located in the heart of downtown Memphis. Take a 1-hour guided tour to see what the recording process was like. Hear tales of how legends like Johnny Cash, Roy Orbison, Jerry Lee Lewis, and the King himself got their start here. Afterward, see the famous Peabody ducks make their way down the red carpet from their fountain to the elevator as they head to bed at the lavish Peabody Hotel. Learn how this unusual tradition was started, then spend about an hour on your own to explore Beale Street, famous for its blues and barbecue, or take a short stroll to the Memphis Rock 'n' Soul Museum (admission is your own expense). Depart this lively downtown scene for the return to Nashville, with drop-off at your hotel after dark.